Physician burnout is real but getting better, according to a new report from Mayo Clinic Proceedings. Between October 12, 2017, and March 15, 2018, researchers at Mayo and Stanford University surveyed US physicians and a probability-based sample of the US working population (methods were similar to previous 2011 and 2014 studies). More than 30,000 physicians were invited to participate, a total of 5197 (17.1%) completed the surveys. Burnout among physicians was measured using the emotional exhaustion and depersonalization scales of the Maslach Burnout Inventory (MBI). In general, burnout typically includes emotional exhaustion, depersonalization, distress and depression. Researchers considered physicians with a high score on the depersonalization and/or emotional exhaustion subscale of the MBI as having at least one manifestation of professional burnout. The results showed that 45% of physicians experienced at least one manifestation of professional burnout during the time period. The study showed that problems with work-life-integration (WLI) were more common in physicians than in workers in other fields, even after adjusting for educational level, hours worked, and other factors. Respondents said the primary causes of burnout were the demands of updating electronic health records because they limit the time spent with patients. Overall the data show that burnout is decreasing since 2011. The highest levels of burnout are in emergency medicine, obstetrics and gynecology, family medicine and neurology. 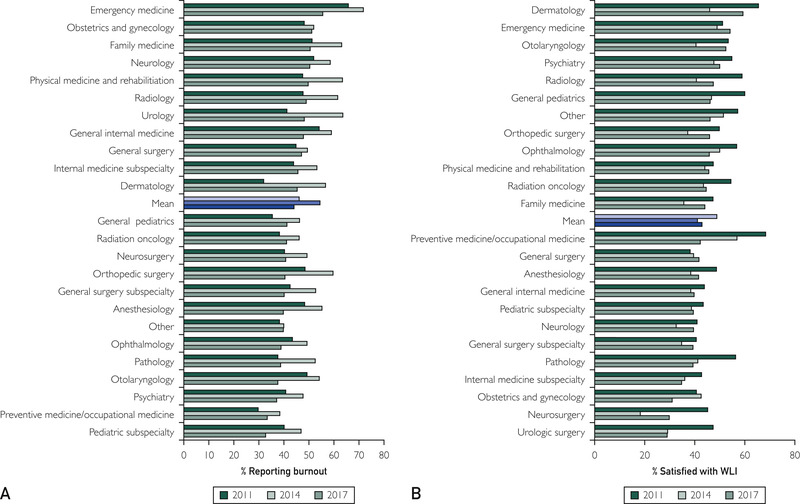 Work-life balance was the lowest among OB/GYN, internal medicine and some surgical specialists (see the chart below).